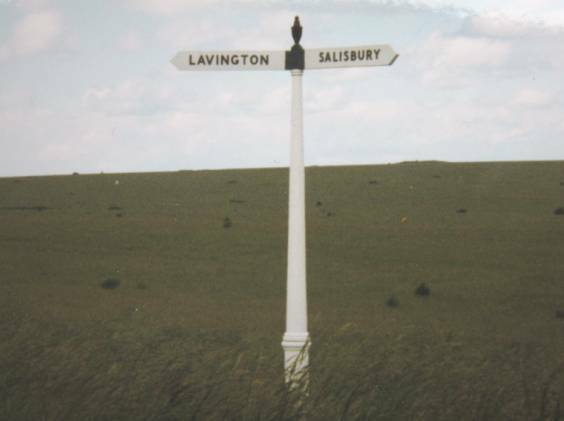 Much of our parish is out of bounds to members of the public for Market Lavington goes for some miles over Salisbury Plain which is military range. However, when the flags are not flying there is a right of way across Salisbury Plain. You start at the top of Lavington Hill and take the track that heads across the plain. It is about 10 kilometres across to Orcheston but on the way you’ll pass the sites of a number of long gone farms. Today we’ll look at the site of one of them called Philpotts. The old farms on Salisbury Plain were never on metalled highways but they were close to tracks. The Plain was always wild and windswept and trees were often planted as shelter for farm houses and buildings. That is what may still offer a sign of past habitation but you might also come across clearly originally cultivated plants even though the inhabitants had to leave more than 100 years ago. This is the site of Philpotts in a photo taken in the early 1970s. This was the shelter belt. By 2008 it was looking a bit more scrubby. If you walk further, you’ll pass New Farm and Candown Farm before leaving Market Lavington. It could be a pleasant way to walk off some of that Christmas lunch that you’ll be having soon but if your tastes are more gentle then you can visit the museum which will open its doors on Sunday 27th and Monday 28th December between 2pm and 4pm. Now there’s a chance to get guests and children out of the house for a while. Pond Farm is one of the lost farms on Salisbury Plain. It was an active farm until about 1910, albeit its piece was disturbed by the summer regimental camps which took place there. Then it became part of the artillery range on a permanent basis. Occupants moved out and farming ceased. Here we merge two pictures. One dates from the Edwardian era and is, of course, black and white and shows the farm in its remote setting. The second dates from 1977 which at 38 years ago is hardly now, but these days there is no public access to the area. Back then it was possible to recognise the area as the same. The 1977 picture is in colour and no doubt it looks much the same today. The pictures should merge, one into the other, every few seconds. There are arrows to click if you feel a need to speed things up. New Farm is, or rather was, one of the farms on Salisbury Plain, in the parish of Market Lavington. To reach New Farm now you’d have to go to the top of Lavington Hill and then, if the flags weren’t flying, continue on the track across Salisbury Plain. After a mile and a bit you’ll find the track passes through a bit of a wooded area. New Farm was in that wooded area on the right hand side of the track. We have looked briefly at New Farm before and this page, https://marketlavingtonmuseum.wordpress.com/2010/10/25/a-resident-of-new-farm/ has a photo of the area taken in 2008. Today we are looking back at a photo believed to have been taken in 1909. The person who gave it to the museum believes it is New Farm although it has to be said, we have doubts because stone like that big blank wall is made of just isn’t found on Salisbury Plain. However, the family shown is a Market Lavington family so the picture is definitely worthy of being seen. 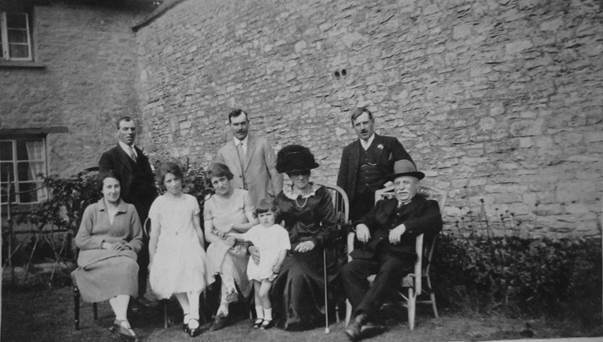 The Cooper family, possibly at new Farm, Market Lavington. This is the Cooper Family (possibly) at New Farm, Market Lavington in about 1909. Seated at the right is James T Cooper, born around 1865. Next to him is his wife, Sarah Jane (née) Taylor also born around 1865. Behind them in the dark suit is their son, George Thomas Cooper born about 1887. The other people are not known, but on the 1901 census (at New Farm) the other children of James and Sarah are Mary, born 1889, Walter, born 1891, Charley, born 1894 and Jacob (named after his grandfather) born 1898. Sadly, nobody alive is going to recognise New Farm. It is now over 100 years since it vanished. But we remain hopeful that people just might be recognised. 1915 was not an easy time anywhere in the UK. 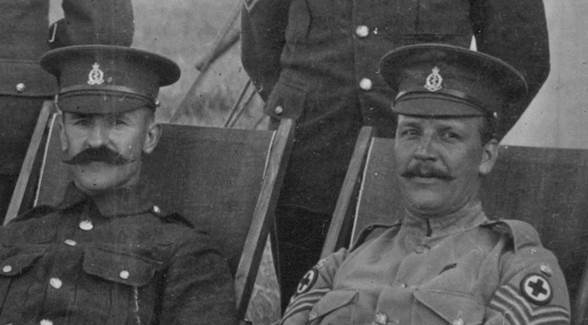 Men had volunteered to fight in the war – and they hadn’t got home by Christmas – unless severely injured. 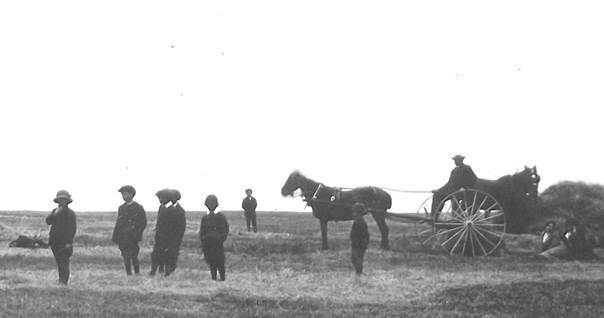 The men were not around when it came to agriculture in 1915 – and this was still a time when farming was very labour intensive. There’s a mix of men, most in unidentified (by us) military uniform but some being local civilians. Local lads have walked up the hill to see the work in progress. This picture has suffered some of the ravages of time, and having been hung in a smoke filled pub and these images are enhanced to give us a better view. 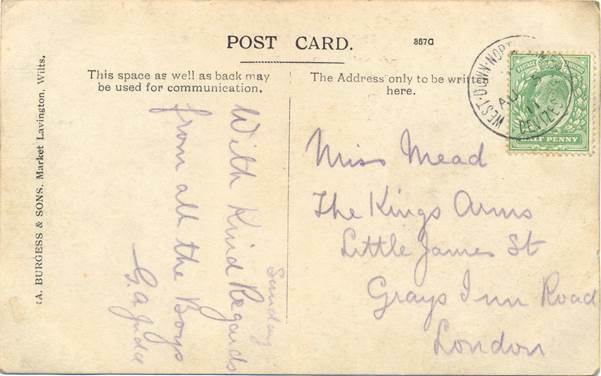 The card was posted from Market Lavington on August 20th 1915. The message suggests that the writer was not much affected by the war. 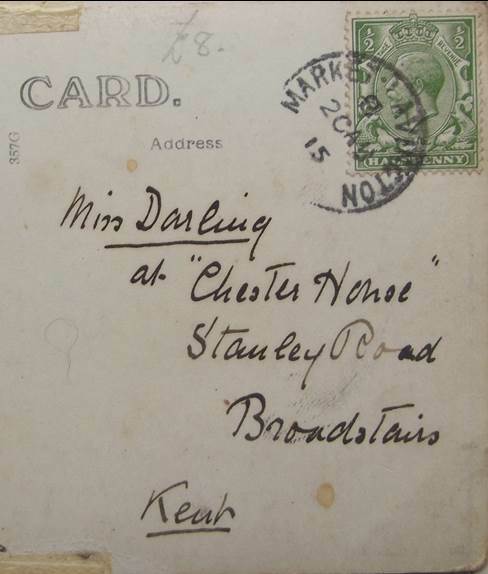 We think the sender may have been a nun, based on another card we have sent from Mona Cottage. There’s no comment on the war – just the weather! 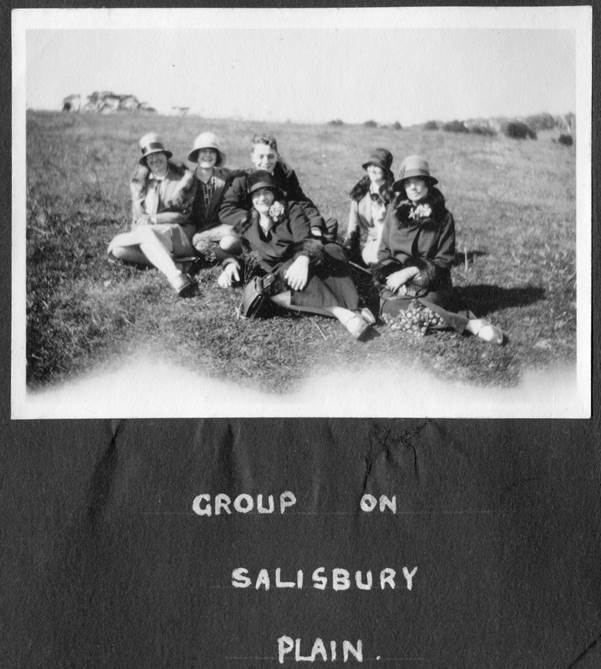 This photo of five young ladies and only one man is captioned as ‘The Group on Salisbury Plain. It comes from the recently acquired album which dates from around 1929. The girls (and one boy) on the Plain with three identified by Pat Hale. We never really expected to precisely find the location, particularly as this is not the sharpest photo in the album. The photo is on a page with others which are in Market Lavington so it seemed likely to be very local. On the left is Betty Pike. She married Harry Hobbs and that pair are Pat’s parents. Next to Betty is her sister, Lily Pike. On the right hand end it is Alice Gale. Well done and many thanks to Pat. This post is really about Market Lavington photographer, Alf Burgess. Alf was not only a photographer, he was very much a business man and he always had thoughts on what would make money. The summer camps that territorial regiments held, up on Salisbury Plain, were clearly a chance to make some money for Alf. 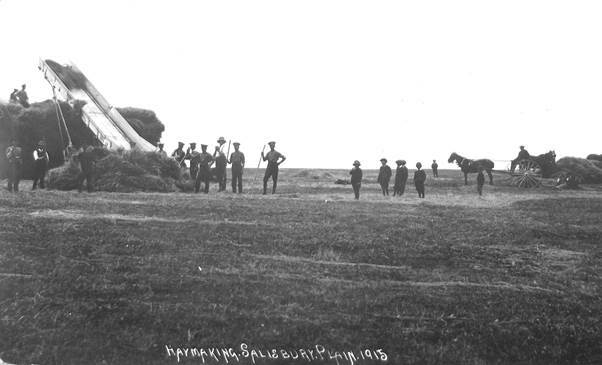 These camps were like holidays with training for the men. They had left parents, wives and sweethearts back home for a week or a fortnight. They needed to write home and what better than a postcard which showed them or maybe their camp. Many of Alf’s photos are of Pond Farm Camp which is above Easterton. Today’s photo may not be taken within our parish for it bears a postmark of West Down North. This camp was within spitting distance of the Drummer Boy Post which is in the parish of Market Lavington but the camp itself was just outside. Let’s look first at the back of the card. It says very little, but we can see the postmark. The card was sent on August 5th 1911. We can also see that the publisher has credited himself on the card. It is interesting to note that even by 1911 Alf was crediting his sons as part of the business. 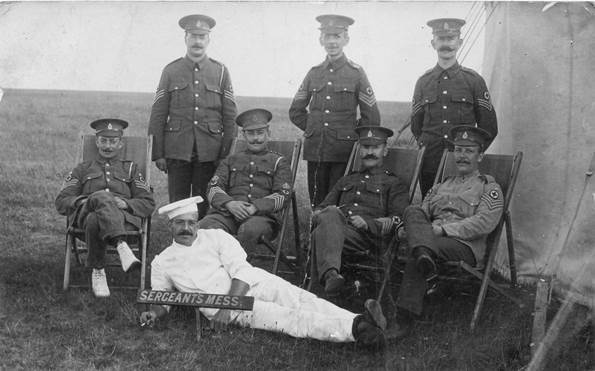 And now to the picture which shows a collection of sergeants relaxing on the bleak downland which is Salisbury Plain. Apart from the chef they all have a cross on their arms, above the stripes. Presumably these could be medical NCOs. The cap badges certainly look like those off the Royal Army Medical Corps. But now let’s think of Alf Burgess, or his sons. Transport for them was the bike. To take the photo the hefty equipment of the day would need to have been lugged up Lavington Hill and then taken some three miles across the rough, rutted tracks to the far reaches of the parish, and then just that bit further. With pictures exposed the whole set of clobber would need to get back down to the Burgess premises on High Street in Market Lavington for the dark room work – developing the exposures into negatives and then printing off each image as a postcard. Perhaps these were then hauled back up to the army camp to effect actual sales. Or, maybe, soldiers were able to escape to purchase their images at the shop and also sample the bright lights of Market Lavington. It’s a far cry from life 100 years on. These days photos like the one above would have been taken on somebody’s smart phone and almost instantly posted so that friends, family or, indeed, anybody could see it, all over the world. 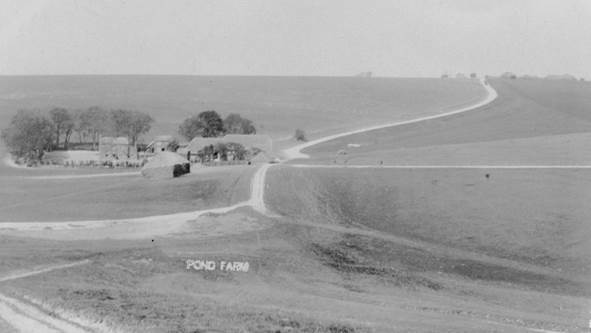 Pond Farm was one of the hill farms of our parish. These days it is in a part of Easterton which the military authorities on Salisbury Plain have completely closed to the public. Our old photo, taken in the Edwardian era, shows the bustling farm, with house, cottages and associated buildings and a really well used track across Salisbury Plain. Our second photo shows the same scene before it was closed to the public but long after the farm had vanished.. 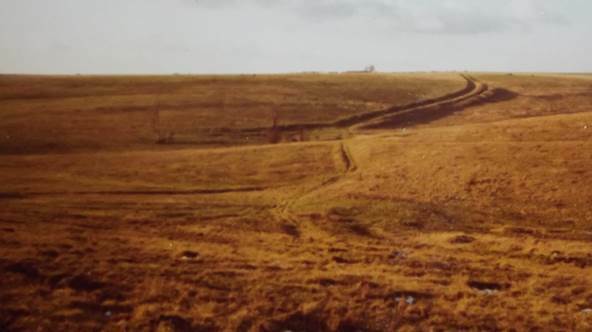 It was taken in 1977 and it portrays the bleak emptiness of the Salisbury Plain landscape. The trackway was still clearly visible, but no longer bore the hallmarks of heavy use. Let’s take a look at the photos as a kind of two shot slideshow. It would be good if the path across to Pond Farm could be re-opened, like the re-opened Jubilee Path in Market and West Lavington. 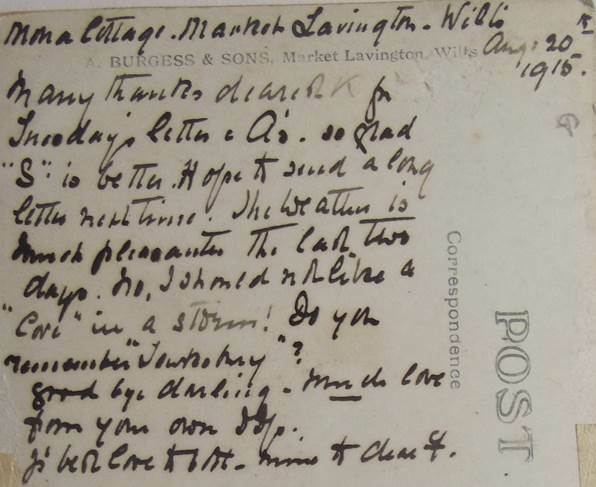 The Miscellany takes place in less than ten days time on 17th September at 7.30pm in Market Lavington Community Hall. 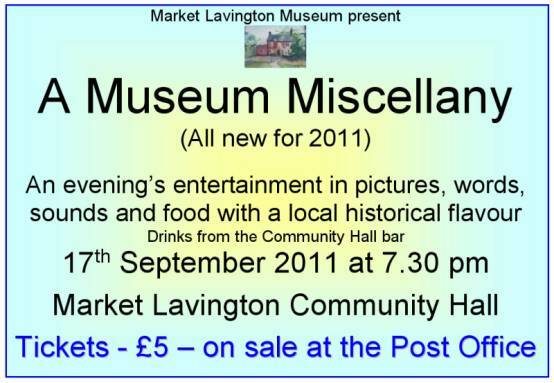 Tickets cost just £5 and are available now from Market Lavington Post Office, or on the door. The event should be every bit as good as last year’s event which was very much enjoyed by a capacity crowd. 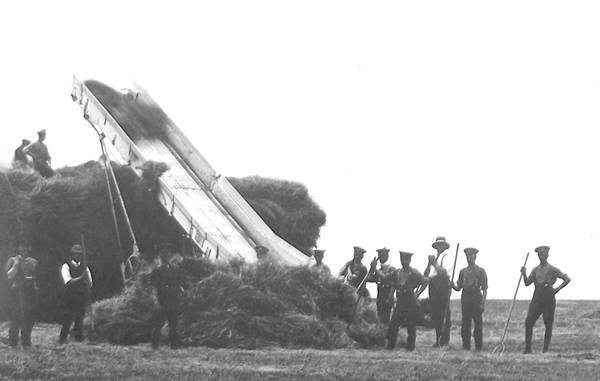 And here’s something you’ll learn the history and mystery of – The Drummer Boy Post out on Salisbury Plain. It has been a way marker in the middle of Salisbury Plain (in Market Lavington parish) for many a long year and it is still there, and a listed building. Don’t miss the Miscellany which mixes fact, fun, fantasy and food. 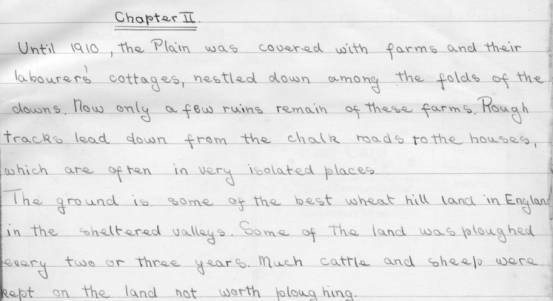 Back in 1934, a young lass called M Welch compiled a school project on Salisbury Plain. Miss Welch became better known to we younger folk as Peggy Gye. Peggy would have been 12 or 13 at the time she wrote this. Her mother had died the previous year and Peggy had a lot to contend with, helping to run a house and look after a younger brother as well as coping with schoolwork. What shines through is her love for her environment for the project covers history, natural history and the people of the Plain as well as aspects of art and culture. From the project we have chosen one small extract. 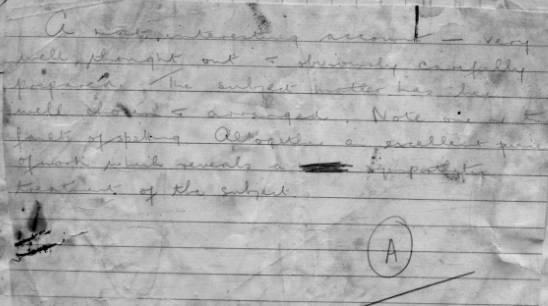 The teacher (unknown) did not have the same clear writing that Peggy used and his comments are hard to read. The teacher's verdict - worth an A grade! A most interesting account – very well thought out and obviously carefully prepared. The subject matter has been well chosen and arranged. Note one or two faults of spelling. Altogether an excellent piece of work which reveals a sympathetic treatment of the subject. Peggy was given a well deserved A grade. You can see the entire document – not in good condition so in need of careful handling – by visiting the museum. You can discover more about schools and schoolwork in Lavington by visiting The Museum Miscellany on September 17th at the Community Hall at 7.30 in the evening.